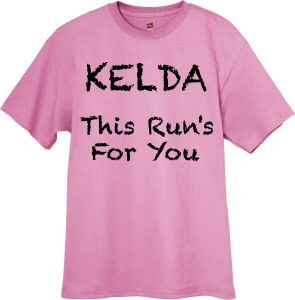 We will wear them in the Tely 10 and get a group picture at the start line to send to Kelda. 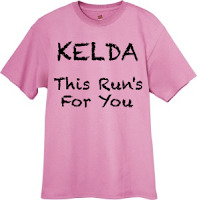 Many of us will then run the Tely as a group (90-100 minutes) but certainly if you plan to "race" feel free to do so ... you can still of course wear the shirt! Cost is FREE for club members and $15 for anyone else who may want one. Due to time constraints we need the order finalized by noon tomorrow Thursday July 12. Update 1:50pm Thursday: Sorry but order deadline has passed. We will have shirts available for pick-up next Wednesday July 18 9pm at the Curling Club, immediately following the Tely 10 race kit stuffing session.